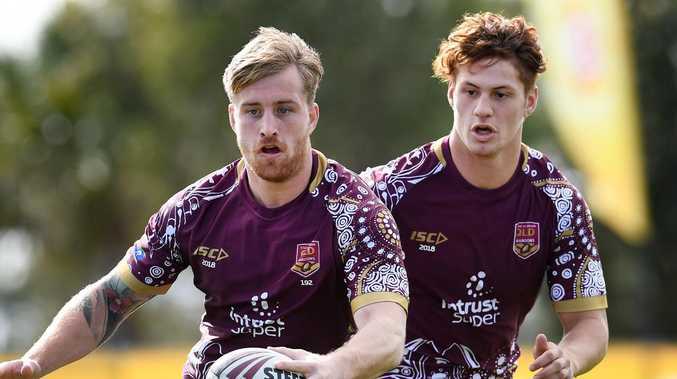 Queensland Maroons coach Kevin Walters wants Cameron Munster (left) to remain in the halves. Cameron Munster may want Queensland's No.1 jersey but Kevin Walters has revealed he aims to retain the Melbourne star in the Maroons halves as Daly Cherry-Evans' long-term partner. Queensland coach Walters said he saw Munster as a "10-year Origin player" as the Maroons No.6 despite the Storm star's desire to replace the retired Billy Slater at fullback. Walters said he wanted to keep the faith with Munster and Cherry-Evans in the halves after they combined for the first time to inspire Queensland's State of Origin game three win last year. "There's no doubt about that," Walters told Former Origin Greats website. "Daly and Munster showed their worth in game three. "With Cameron, he doesn't realise just how good he can be at representative level. "He has been outstanding for us in the five-eighth role. "I see Munster as a 10-year Origin player." representative football with Walters' preference to play Munster in the halves. But just where returning North Queensland playmaker Michael Morgan fits into the Maroons line-up remains to be seen. Morgan is returning from a biceps injury that has sidelined him since June. Walters said it was a good selection headache to have with Newcastle young gun Kalyn Ponga also pushing for a starting berth after a stellar Origin debut off the bench in 2018. "We didn't miss last year's series by much and we lost a wealth of experience we relied so heavily on," Walters said. "I think we've got the right mix of players to do well and win the series. "We didn't get it right last year so it's important the players learn from it and get things right this year."